The subgenus Neosmia Tkalcu is confined to the Palaearctic region. It contains 8 species. 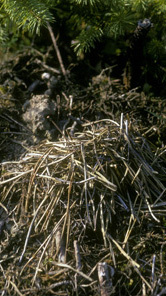 1 species is still undescribed (A. Müller, unpublished). 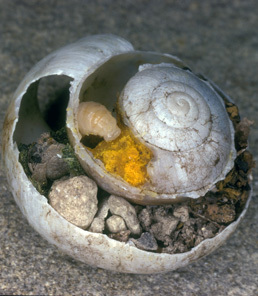 Osmia (Neosmia) bicolor (Schrank, 1781): Pile of pine needles completely covering the nest in an empty snail shell (left); opened nest with the feeding larva and the nest plug composed of pebbles and earth crumbs (right). Foto A. Krebs. 1895 Osmia cinnabarina Pérez, Espèces nouvelles de mellifères de Barbarie, p. 10. Type material: Lectotype f, by designation of Tkalcu (1977a: 93), “Tlemcen” [Algeria], MNHN (Paris).-Combination Osmia (Osmia) cinnabarina Pérez in Friese (1911b: 88). Distribution-Northern Africa: DZ, E(Ca), MA, TN. Southwestern Asia: IL. Identification-Keys, Descriptions: Ducke (1900); Peters (1975: 54-55); Tkalcu (1977a, 1993b: 815). Flower preferences: Polylectic; pollen sources include Fabaceae, Reseda (Resedaceae), Brassicaceae, Cistaceae and Cichorioideae (Asteraceae) (A. Müller, unpublished, based on 16 pollen samples from 11 different localities). Flower record: Reseda lanzerotae (A. Müller, unpublished). 1895 Osmia gracilicornis Pérez, Espèces nouvelles de mellifères de Barbarie, p. 10. Type material: Lectotype f, by designation of Tkalcu (1974b: 335), “Tunis” [Tunisia], MNHN (Paris). Type species of Neosmia Tkalcu.-Combination Osmia (Osmia) gracilicornis Pérez in Friese (1911b: 88). Distribution-Northern Africa: DZ, MA, TN. Southwestern Asia: IL. Identification-Keys, Descriptions: Ducke (1900); Tkalcu (1974b: 334, 1977a). Flower preferences: Polylectic; pollen sources recorded so far are Brassicaceae, Cistaceae, Fabaceae, Asteraceae (Asteroideae, Carduoideae and Cichorioideae) and Boraginaceae (e.g. Echium) (A. Müller, unpublished, based on 16 pollen samples from 10 different localities). 1899 Osmia purpurata Ducke, Entomologische Nachrichten (Berlin), 25: 215. Type material: Syntypes ff, “Algerien” [Algeria], ZMHB (Berlin), presumed lost (Tkalcu, 1977a: 93).-Combination Osmia (Osmia) purpurata Ducke in Friese (1911b: 88). Identification-Keys, Descriptions: Ducke (1900); Tkalcu (1977a). 1841 Osmia rufigastra Lepeletier, Histoire Naturelle des Insectes, Hyménoptères, vol. 2, p. 324 [not seen]. Type material: Lectotype f, by designation of Tkalcu (1977a: 92), “Oran” [Algeria], MNHN (Paris).-Combination Osmia (Helicosmia) rufigastra Lepeletier in Schmiedeknecht (1885: 92 ). Combination Osmia (Osmia) rufigastra Lepeletier in Friese (1911b: 107). Combination Osmia (Diceratosmia) rufigastra Lepeletier in Michener (1941: 162). Identification-Keys, Descriptions: Ducke (1900); Schmiedeknecht (1885-1886); Tkalcu (1977a). 1894 Osmia scutispina Gribodo, Bullettino della Società Entomologica Italiana, 26: 102. Type material: Syntypes ff, “Boghari, Ponteba” [Algeria], MSNG (Genova). 1920 Osmia rosea Friese, Deutsche Entomologische Zeitschrift (Berlin), 1920: 50. Type material: Lectotype m, by designation of Tkalcu (1977a: 93), “Tunis merid.” [Tunisia], ZMHB (Berlin).-Synonymy in Tkalcu (1977a: 93). Distribution-Northern Africa: DZ, LAR, TN. Flower preferences: Polylectic; pollen sources recorded so far are Fabaceae, Cistaceae, Asteraceae (Cichorioideae), Lamiaceae and Brassicaceae (A. Müller, unpublished, based on 3 pollen samples from 3 different localities and the pollen content of 12 brood cells of two nests from the same locality). 1969 Osmia tingitana Benoist, Bulletin de la Société Entomologique de France, 74: 243. Type material: Lectotype m, by designation of Zanden (1986: 74), “Tanger” [Morocco], MNHN (Paris); paralectotypes mm. 1977 Osmia (Neosmia) tkalcui Peters, Entomologische Zeitschrift (Stuttgart), 87: 22. Type material: Holotype m, “Cyrenaica” [Libya], SMFD (Frankfurt); paratypes mm, ff.-Synonymy in Zanden (1986: 74). Identification-Keys, Descriptions: Tkalcu (1977a); Zanden (1986: 74). Flower preferences: Polylectic; pollen sources recorded so far are Fabaceae, Cistaceae, Asteraceae (Asteroideae, Carduoideae) and Brassicaceae (A. Müller, unpublished, based on 9 pollen samples from 3 different localities). 1977 Osmia (Neosmia) tkalcui secunda Peters, Entomologische Zeitschrift (Stuttgart), 87: 25. Type material: Holotype m, “Tripolitania, Garian, ca. 2500 Fuss” [Libya], BMNH (London). 1969 Automatically established nominotypical subspecific taxon (original description and type specimen are identical with those of the species rank taxon of the same name above). Distribution-Northern Africa: DZ, ET, LAR,MA, TN. 1781 Apis bicolor Schrank, Enumeratio Insectorum Austriae Indigenorum, p. 400. Type material: f(f), “Viennae” [Austria], presumed lost (Tkalcu, 1977a: 97).-Combination Osmia (Helicosmia) bicolor (Schrank) in Schmiedeknecht (1885: 22 ). 1785 Apis rustica Geoffroy, in: Fourcroy, Entomologia Parisiensis, vol. 2, p. 451. Type material: f(f), “Paris” [France], presumed lost (Tkalcu, 1977a: 97).-Synonymy in Tkalcu (1977a: 97). 1791 Apis fusca Christ, Naturgeschichte, Klassification und Nomenclatur der Insekten, p. 182. NOMEN PRAEOCCUPATUM [not Apis fusca Scopoli, 1763]. Type material: No original material known, [Germany].-Synonymy in Warncke (1986: 99). 1791 Apis hirundinaria Christ, Naturgeschichte, Klassification und Nomenclatur der Insekten, p. 188. Type material: No original material known, [Germany].-Synonymy in Warncke (1986: 101). 1841 Osmia pyrenaea Lepeletier, Histoire Naturelle des Insectes, Hyménoptères, vol. 2, p. 319 [not seen]. Type material: f(f), “Pyrénées. Barèges” [France], MNHN (Paris).-Combination Osmia bicolor pyrenaea Lepeletier in Dalla Torre (1896: 387).-Synonymy in Pérez (1879: 175). 1857 Osmia fusca Gistel, Vacuna, 2: 537. NOMEN PRAEOCCUPATUM [not Apis fusca Christ, 1791]. Type material: No original material known, “Monachii” [Munich] [Germany].-Synonymy in Schwarz et al. (1996: 121). 1879 Osmia rufitarsis Smith, Description of New Species of Hymenoptera in the Collection of the British Museum, p. 61. Type material: Holotype f, “Angara River, Siberia” [Russia], BMNH (London).-Synonymy in Tkalcu (1995: 142). 1917 Osmia monachiensis Strand, Archiv für Naturgeschichte, 82: 98. NOMEN NOVUM with same type specimen for preoccupied Osmia fusca Gistel, 1857 [not Apis fusca Christ, 1791]. Distribution-Europe: A, AL, B, BG, BY, CH, CZ, D, E, F, FIN, FL, GB, GE, H, HR, I, L, LT, N, NL, P, PL, RO, RUS, S, SCG, SK, SLO, UA. Northern Asia: RUS(ES), RUS(WS); Turkestan. Identification-Keys, Descriptions: Amiet et al. (2004); Banaszak and Romasenko (2001); Benoist (1931); Ducke (1900); Móczár (1958); Radoszkowski (1887a: 292); Scheuchl (1996); Schmiedeknecht (1885-1886); Tkalcu (1977a). Flower preferences: Polylectic; pollen sources recorded so far belong to 18 different families including Asteraceae (Amiet et al., 2004; Müller, 1991; Westrich, 1989; A. Müller, unpublished, based on 4 pollen samples from 4 different localities). 1929 Osmia Jason Benoist, Bulletin de la Société Entomologique de France, 1929: 95. Type material: Holotype f, “Comana Vlasca” [Romania], MNHN (Paris). Distribution-Europe: BG, GR, MK, RO, SCG. Southwestern Asia: IL. Flower preferences: Polylectic; pollen sources recorded so far are Fabaceae, Cistaceae, Asteraceae (Cichorioideae), Lamiaceae (Lamioideae, Nepetoideae) and Zygophyllaceae (A. Müller, based on 3 pollen samples from 3 different localities). Flower record: Salvia fruticosa (label record).